Big changes for Tea Light Village this year! I have been adding to it every year since I first designed it in 2013 and this year I have added two new buildings but I have also solved the lighting issue. If you have been building the village right along you have learned that turning 14 different tea lights on and off is a real bother. It was for me so I tend not to light up the village. It really is much prettier when lights are glowing out the windows. So I spent some time thinking about it. What I really wanted to do was use the remote control string fairy lights instead. They all turn on with one press on the remote button. Easy! But I don't like seeing the wires and stray lights between buildings. So I designed a solution. Available now is a hexagonal base system. You cut the bases you want for the village you have created, attach them together and run wires through the base. It is quick and easy. It creates multi-levels for display plus plenty of room for the wiring. The bases come in 6 depths plus 2 shapes and are available here. Using these nifty strings lights available from Amazon (link below) you can improve the lighting in a number of ways. All lights are operated by 1 switch. The switch is a remote for easy access. Flickering is a choice. I disliked the tea light flicker. It made me think of houses on fire. You can control the brightness. If the room has other lights on, push the brightness. If the room is dim, reduce the brightness. These are all huge pluses for me. Additionally there are two new buildings to expand the village. This year I designed a Tudor style home with the off center front dormer and classic curved doorway plus a clock tower library. Both are scaled to fit with all the other buildings already in tea light village. Complete 2017 Tea LIght Village - $10.59 - Buildings only here. 2017 Additions - Tudor House and Clock Tower Library - $2.59 here. 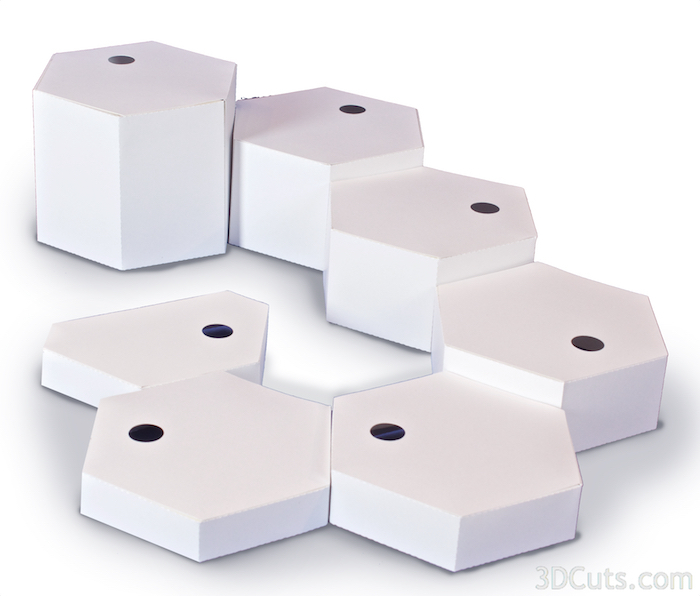 Hexagon Bases - Not incllude in the complete set - $3.99 here. Hexagon Bases and Wiring here. And here are links to the supplies I use for this project.